We love beets. A big part of our garden is dedicated to growing heirloom varieties such as Bull’s Blood, Chiogga & Crosby’s Egyptian Beets. The hues of red, mauve & pink are gorgeous and the flavours are equally as bright and earthy. Although many beets will be kept in cold storage for fresh eating, canning plan beets is a convenient way to enjoy them in the winter. It speeds up the preparation of recipes like Borscht (beet soup). This recipe uses the par-boiled pressure canner method which enables you to safely preserve and store your fresh beets. When you par-boil beets the skins slip right off in your hand. No peeling required. The trick to this recipe is to keep everything hot. To safely process low acid foods such as beets in water, you should use a pressure canner. You need to reach very high temperatures that are difficult to achieve with a water bath canner. This Food Preservation quick Reference Guide by the University of Minnesota Extension is a terrific guide for processing low acid food using pressure canning equipment. If you are harvesting your beets from your own garden, it is best to do this in the early morning or late evening when the sun is not too hot. For maximum quality and freshness don’t let your harvest sit around too long before you start preserving. If it does need to wait store your beets in a cool dark place. 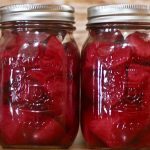 If you like this recipe you might also like Home Canning: Pickled Beets with Dill Recipe or Canning Carrots: Raw Packed Carrot Recipe. Scrub your beets and cut the greens leaving about an inch of stems. Keeping the protective layer of the beet completely intact will reduce bleeding and help retain the gorgeous color and vibrancy. Place your beets in a large pot of simmering water. Simmer for about 15 minutes. 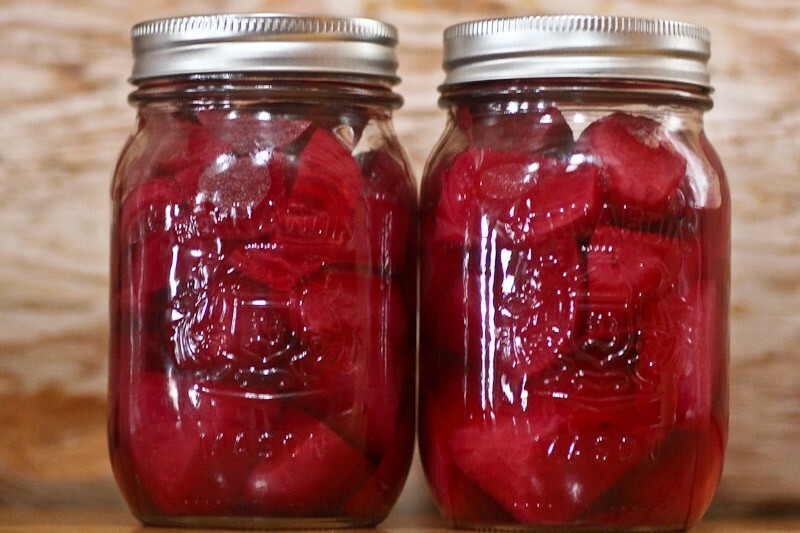 While the beets are simmering get your pressure canner ready, wash and sterilize your jars and keep them hot. 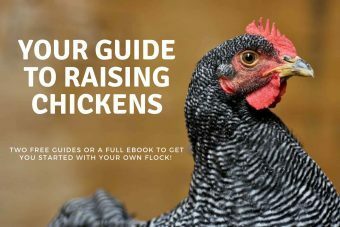 Store them in a pot of hot water, in a warm oven. Do not boil or overcook your beets. The pressure canning process will soften them further and you don't want them to get too mushy. Carefully test your beets. Remove one beet and use a knife to carefully scrape at the skin. If it flakes off with ease turn off the heat and let the beets cool a bit so that you can handle them without burning your hands. The skins should slip right off. Try to keep your beets as warm as possible. Chop your beets to the desired size. Slice, dice, halve, quarter, whatever you prefer. Be careful to remove and discard any blackened or damaged pieces. 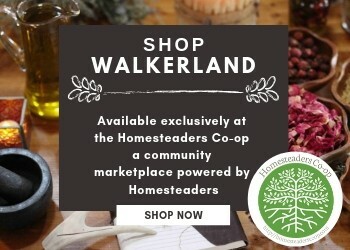 Fill your hot jars with beets leaving a full 1" of head space. If you want to you can add a tsp of salt (we don't). Pour in hot purified water. Remove air pockets by gently running a knife or a chopstick around the inside of the jar. You might need to top up the water a little bit once you have removed all air pockets. Wipe the jars and rims and put the lid and tighten the rings. Set them in your canner. Refer to your product manual for operational instructions on your pressure canner. For elevations under 1000 process at 10 pounds pressure, pints 30 minutes and Quarts for 35 minutes. When the processing time is done, turn off your heat source and let the pressure canner cool down fully, this takes about an hour. Do not try to open the canner early. Once Ready using a jar lifter carefully lift the jars and place them on a cutting board or towel. Once the jars have cooled for 24 hours, check their seal. You should hear the occasional pinging sound as they are cooling that gives you an auditory confirmation that your jars have sealed. If you look at the lid of the jar, you should notice that there is a small bump in the lids. This bump depresses as the jars seal "sucking it down". All of the lids should be sucked down. If you press on the center of the lid and that bump pops up, they are not sealed properly. If you should have an issue with a jar not sealing, refrigerate it and eat within a few weeks. Remove the metal rings and wipe the lids and jars with a damp clean cloth. Store the jars without the rings in a cool dark place. Tip: Gather up all of your supplies and organize your canning station before you get started. The task will be far more relaxing and will be accomplished faster. Read your recipe from beginning to end and if you are new to canning, it can help to print your recipe and then use a pen to cross off each step as you accomplish it to make sure you don't miss anything.